Heat pump systems offer an efficient alternative to air conditioners and other heating systems by providing conditioned air at approximately one quarter of the cost. Heat pumps are most popular in southern U.S. regions where winters are mild and the summers are hot. Areas of the country subjected to prolonged winters and subfreezing temperatures are not ideal for this type of system. Learn about how these HVAC units work and the heat pump repair process. Depending on the scope of the project, replacing or installing a new heat pump system in your home is usually an all day project. After the technicians arrive and introductions are made, they will disconnect the old equipment, remove remaining refrigerant from the system with a reclaim unit and disconnect the power supplying the system to dismantle it. When necessary, the technician will install a new support pad for the condensing unit and make any repairs or adjustments to the closet and supports that hold the air handler assembly in place. They may also upgrade electrical wiring and copper supply lines before installing the new equipment. Once the evaporator (inside unit) and condenser (outside unit) are set into place, they will connect the copper refrigerant lines to the two pieces of equipment. The copper refrigerant lines, referred to as the high and low pressure lines, are used to ferry refrigerant between the two units. After welding the pressure lines to the equipment, they will hook a vacuum pump to the system to evacuate air and foreign particles from the lines. While the vacuum is taking place, the technician will connect the electrical wires to both the condenser and the air handler to supply electric to the system and install a new thermostat. The air handler assembly requires that it be connected to the plenum and adjoining ductwork. The technician should use duct board, metal foil tape and mastic to guarantee an airtight seal where the two adjoin. In some cases, sheet metal replaces the duct board as older duct systems were fabricated using this material. By this time, a sufficient vacuum should be completed and the technician will disconnect the vacuum pump. They will charge the new system with the applicable amount of refrigerant, install an air filter in the air handler and power on the system. After the system is up and running, the technician should recheck refrigerant levels and run various temperature and pressure checks on the equipment. Airflow and temperature tests will also be performed to verify the new heat pump system is operating correctly. Once satisfied the installation is complete, and the system is up and running correctly, the technician should load up all debris created during the install and clean any work areas both inside and outside the home. Of course, there is a lot more to heat pump installation and repair than covered above. The information is intended to give you a general idea of the process and prepare you for the project. Methods will vary between different contractors and heating/air conditioning companies for their preferred heat pump repair process. A heat pump works primarily by transferring outside heat to the inside of your home during the winter months. During the summer months it transfers heat from inside your home to the outside. Three of the five main components — condenser, compressor and reversing valve — make up the outside unit. The other two — evaporator and air handler — are part of the inside unit. During the heating cycle, as liquid refrigerant circulates through the outside condenser coils, it absorbs heat and transforms into a gas. As the gas travels through to the indoor evaporator coils, it releases the heat which is dispersed into the home via the air handler and duct system and converts back into a liquid. During the cooling cycle, the process is reversed. This type of heat pump system is commonly referred to as an air source heat pump. Numerous problems or malfunctions can result in your heat pump not operating efficiently or not working at all. This section will review common problems that can lead to heat pump failure and what steps you should take for heat pump repair. Start with the thermostat and verify it is in the “on” position and the temperature is set up or down calling for heat or cool. If your system is equipped with a lighted display, it provides a good indicator the thermostat has power. Switch the fan setting to on versus auto. The fan or blower in the air handler usually activates regardless of the condenser’s outside unit status. Check the circuit breakers that supply the heat pump and air handler with electricity. They should be located in the main circuit breaker box or a sub panel. If the breakers have tripped, turn them off and then back on to reset. If the breakers trip again, something within the system is shorted out. 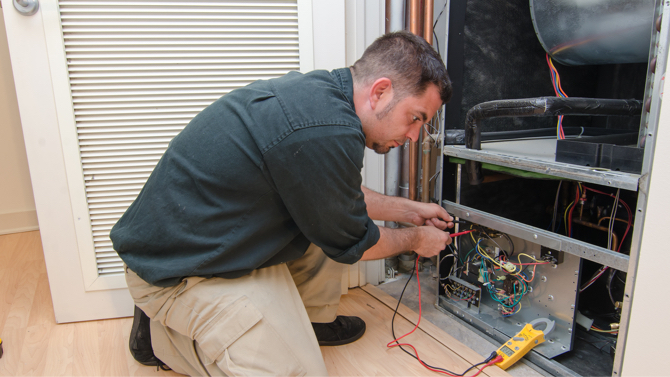 Contact your HVAC contractor to schedule an appointment for the needed heat pump repair. Many systems include a circuit breaker on the air handler that is generally located in a closet or attic. The breaker is often installed to protect the emergency heating elements inside the unit. If this breaker has tripped, turn it off, then on again to reset it. When your heat pump is running but not producing conditioned air, several measures might correct the problem. Verify the thermostat settings to ensure that, when calling for cool air, it is set below the existing room temperature. If you are calling for heated air, the thermostat should be set to a higher temperature than the existing room temperature. Also, make sure the fan switch is in the “on” or “auto” position. Verify that the systems air return vent — the large vent located near or under the air handler — is not obstructed and can breathe freely. You should also clean the return air vents frequently to eliminate dust, dirt and debris from entering the system. Doing so also helps to maintain better air quality in your home. Clean or replace dirty or damaged filters to allow maximum airflow to the air handler. When these become clogged, your unit cannot breathe properly and will work harder to produce conditioned air. The extra load reduces the equipments expected life, leads to equipment failure and causes it to consume more electricity, resulting in higher energy costs. If your system has been neglected with failure to change filters regularly, the evaporator coils are probably dirty. Dirty evaporator coils decrease circulation and airflow through the system, puts additional strain on its components and causes the system to work harder, using more electricity. Many components associated with a heat pump system can malfunction, leading to inadequate system performance or a total shutdown. Since most heat pump failures require the services of a professional heating and cooling technician, it is not recommended that you try these repairs yourself. The following list includes common problems and repairs associated with a heat pump system. If your heat pump’s defrost timer fails, your unit will begin to develop ice on the outside coils surrounding the compressor. Because the refrigerant circulating the outside coils is cooler than the surrounding air, condensation can develop on the coils and freeze during the winter months. When this occurs, the required air circulation is cut off, leading to heat pump failure. The defrost timer must be changed or adjusted to correct the problem. A faulty thermostat, one that is wired incorrectly or is the wrong type will prevent the heat pump system from working properly. To avoid short-circuiting system components and causing more damage, it is imperative that only experienced and knowledgeable technicians install or replace a heat pump thermostat. A circuit breaker that is incapable of handling its intended load by supplying the inside air handler and/or outside compressor may have tripped. This is also a common occurrence in older systems due to a heavier load from the compressor. As a compressor ages or becomes worn, it can require more electricity to function properly. When it starts to draw more electricity than the rating for the circuit breaker, the breaker will trip to prevent circuit damage and/or fire. If this problem occurs frequently, you are probably facing compressor or whole system replacement. This could be means for heat pump repair. The system comes on but does not circulate air through the registers and vents. This could be as simple as a dirty filter or a sign of a more serious problem. Inadequate maintenance by failure to change the filters can cause the evaporator coils to ice up and block airflow. 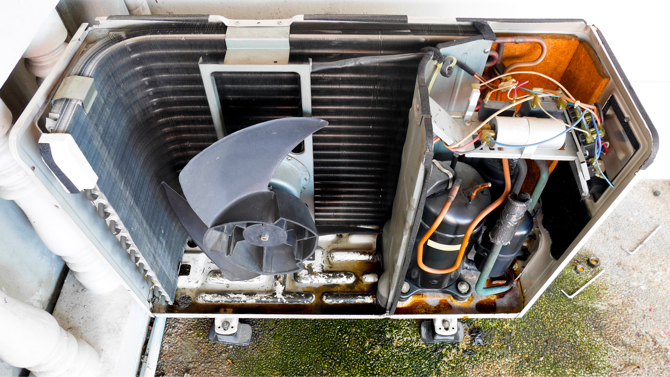 Dirt and other debris can attach to the evaporator coils restricting airflow and inviting ice buildup. Replacing the filter and cleaning the evaporator coil may correct this problem. Another cause could be a restriction in the ductwork or a faulty blower or fan motor in the air handler needing heat pump repair. Ice buildup or blockage on the evaporator or condenser coils could be a sign of low refrigerant levels in the system. Schedule an appointment with a certified heating and air conditioning technician. Here are some helpful pages to prepare you for your air conditioner repair project. Here are some other helpful pages to prepare you for your home heating replacement project.